As it is a requirement of being an Incorporated Society, along with it being a condition of our various licences, everyone who comes into our Club must be a member or be signed in as a guest of a current member. Massé Incorporated has a range of membership options to suit. 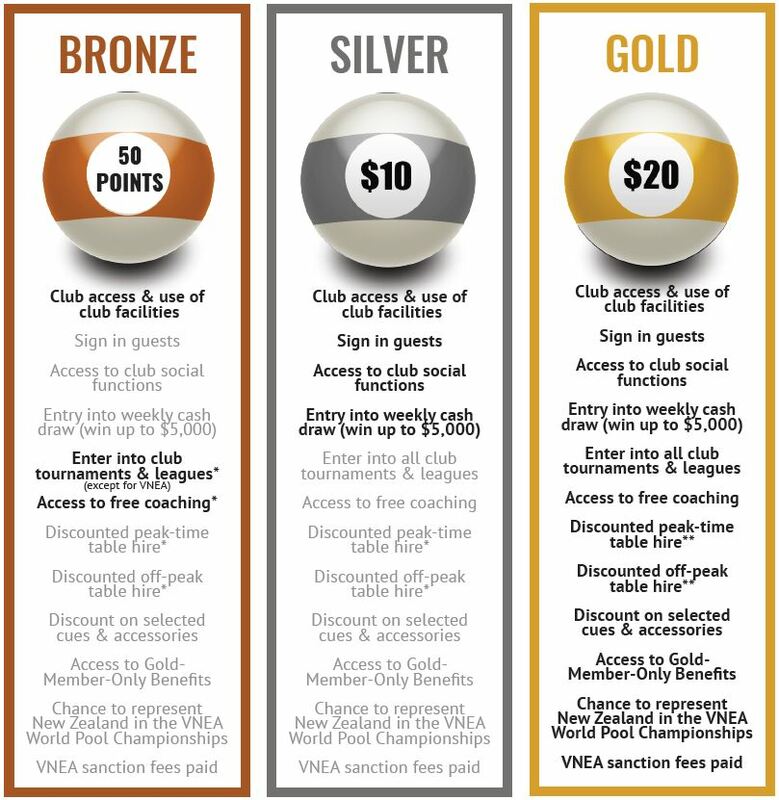 Massé offers three types of memberships which are Bronze, Silver and Gold. Listed below are the different rates and fees associated with each membership type. A Gold Membership is just $20 for a full year running April 1 to March 31. Gold memberships can be purchased at a discount of $10 if you have either: A valid Student ID, Community Services Card, Senior Citizen Gold Card, or if you are under 18 years old (junior). As a gold member, you will receive a full range of benefits including access to all Massé clubs and facilities, ability to sign in guests, access to Massé club social functions and automatic entry into a weekly cash prize draw where you could win between $500 -$5,000 every week! An added benefit of being a gold member is access to club discounts, such as discounted table hire (during both peak times and off-peak) and discounts on selected cues and accessories. This membership also entitles you to enter into all club tournaments and leagues and be coached professionally by a qualified coach. If that wasn’t enough, all gold members get the chance to compete in Massé VNEA 8 Ball Leagues where the best players get selected to represent New Zealand in the VNEA 2018 World Pool Championships in the USA. If you are selected to play for this team, Massé will cover the cost of your flights, accommodation and entry fees. By purchasing a gold membership, you can expect to save lots of money throughout the year on club discounts. This membership is the best value for money and includes the most benefits. For only $20 this is by far the best membership option available. A Silver Membership is just $10 and is available to anyone. This membership option is great for those who only play pool socially and would like to attend club social functions. This membership also allows you to sign in guests. A great benefit of this membership type is that you gain entry into the weekly draw where you can WIN between $500 – $5,000 every week! If a member purchases a Gold or Silver membership after October 1 each year, the membership fee is halved for the last six months of the membership year. To take advantage of any of these membership options come into your nearest Club and fill out an application form.